I’m delighted to have Malia here today to share her creativity. I am so impressed with her artistry, and love the designs she creates and shares. 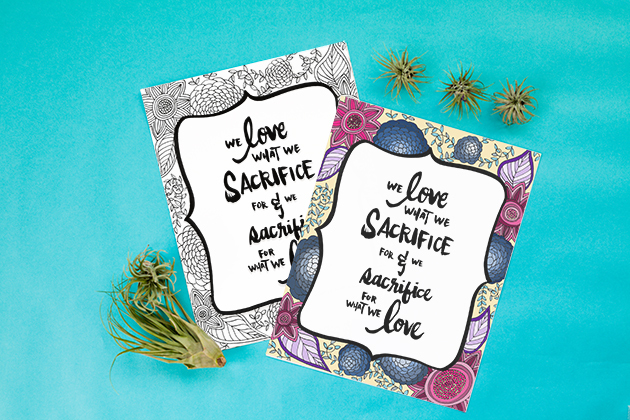 I really believe in having inspirational quotes up, and around our homes, and I love the option to print her designs in color, or black and white to color it yourself! Hi friends! It’s Malia from Malia Creative here to share an adult coloring page printable with brushed hand lettering today. I recently heard a great quote and it rang true for me. One of my favorite stories that my mother-in-law tells about my husband is when he was a young boy, coloring at a doctor’s office and someone in the office mentions that the tree he is coloring shouldn’t be blue. My mother-in-law is incredibly artistic and an open, accepting person. She replied to her son (and the person commenting) that if he thinks the tree should be blue, then go ahead and color the tree blue. I love that about her and for instilling that lesson in her son (my husband). I love that we can stand for what we believe while being able to color our lives however we want it to be. 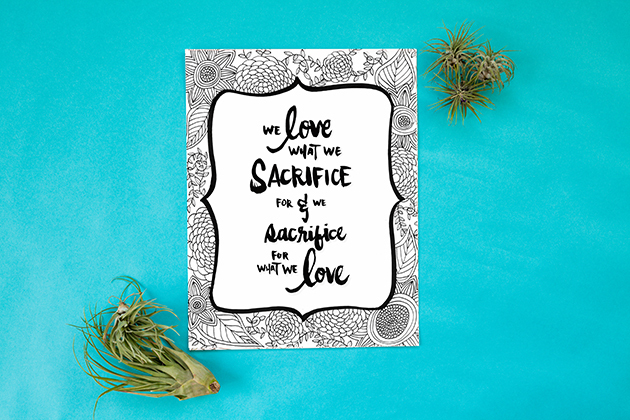 So whatever it is that you sacrifice for, make sure it is something that you love. All the best! Click here to download coloring page.